Head and Neck : Black with green lustre on the head and upper neck. Eyes: Dark brown. Bill: green, dark bean. No white collar. Back: Dark grey-brown, shading to greenish black over the rump. 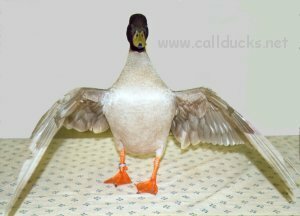 Breast: As flank feathers; no claret bib. Flanks etc. Light grey, each feather finely stippled (pencilled, like the Dark Campbell) with dark grey. 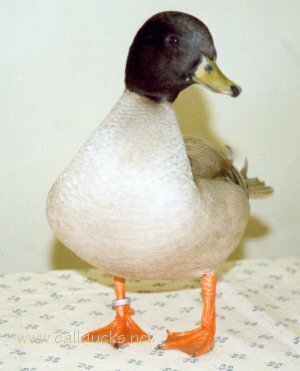 Tail: Grey-brown, paler outer feathers; coverts and undertail greenish black. Wings: Primaries grey-brown. Secondaries: (speculum) sooty grey with slight iridescence only, tipped with fine whitish-grey line. Tertials grey-brown. Minor coverts grey-brown; secondary coverts tipped with white then fine black line. Scapulars slightly darker than Mallard, brown edged. Under-wing coverts pearly grey-blue; axillars pale brown-grey. Legs: Legs and webs dull orange. 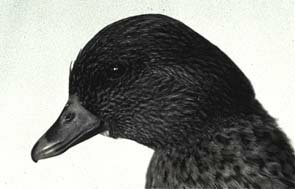 Head and Neck :Brown, with darker graining. No eye stripes. Eyes: Dark brown. Bill: Dull grey-brown with dark bean and saddle. Back: Brown, with darker pencilling (chevrons). Breast and flanks: Brown, with dark brown pencilling on each feather. Underbody similar. 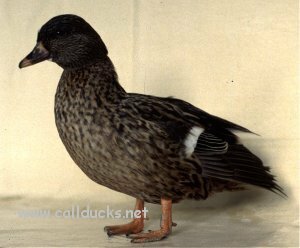 Tail: Dull dark buff, irregularly marked with brown; darker tail feathers in the centre than the outer edges. Wings: Primaries, secondaries and tertials dull brown. Slight iridescence only on sooty grey secondaries, tipped with faint whitish-grey line. Minor coverts brown-grey; secondary coverts tipped with white forming a bar above the secondaries. Under wing coverts and axillars as drake. Legs: Dull orange with darker webs. Male: Any indication of claret bib. During eclipse: any sign of eye stripes. Female: Any evidence of eye stripes. Both: White neck ring. Cream or white axillars and under wing coverts. White primary feathers. Iridescent blue speculum. Blue eyes. Male: Lack of black undertail. Both: White feathers under the bill. Blue Dusky drake. His head is a darker (charcoal blue) colour than the Apricot Dusky. The dusky blue drake flapping shows the pigmented underside of his wings - a true dusky characteristic. 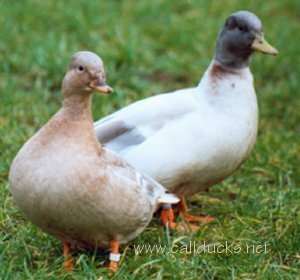 Pair of Apricot Duskies - two blue genes in the presence of dusky genes.